I’ve had a dual career, as a documentary filmmaker and fine-art photographer specializing in architecture, and I’ve struggled over the years to express my Jewish identity in my work. While working at the Canadian Broadcasting Corporation in 1992, I had an opportunity to go to Poland to make a short film about Poland’s “hidden” Jewish child survivors of the Holocaust. The trip was an eye-opener for me. I was deeply moved by the efforts of those Jews to live Jewish lives in a country which was then only emerging from the nightmare of decades of repression and in which many people, too many, still clung to anti-Semitic stereotypes as a substitute for understanding history and politics. But I was completely overwhelmed by the material culture to which I was exposed, the remnants of Jewish life, particularly the cemeteries and the architecture. Those physical remains spoke deeply to me, mute evidence and concrete expression, ironically, of the lives of those vibrant communities before the onslaught and their sudden demise. Since then, I have returned repeatedly to Poland. As a filmmaker, I have developed a strong interest in Yiddish culture, and as a photographer I find it inspirational to be in a country with such a direct, continuing connection to the Yiddish world that once flourished in Poland and the surrounding states. I find the cemeteries particularly moving, for the beauty of the stone work, both decorative and calligraphic, for the large size and intricate designs of many of the monuments, and for their lengthy and poetic inscriptions, usually in Hebrew but also in Yiddish and Polish. In the artwork, one can see the struggle between tradition and modernity, and in the inscriptions, one can see in the idealized descriptions of the deceased the expression of changing communal values. Through these artefacts in the “Houses of Life,” the histories of these communities come to life. Ironically, it was the years of neglect under Nazi occupation and then the Communist regime that added to the visual appeal of Jewish cemeteries in Poland. Before the Second World War, they were as manicured and constrained as most Jewish cemeteries in North America, but over five decades forests were allowed to grow up among the graves. Today, partly wild, partly tended, the Jewish cemeteries in Lodz, Warsaw, Krakow and Wroclaw are perfect gardens, visually arresting, constantly changing, inviting and restful both for the visitor and those who lie within. I have found in these gardens a photographic subject that is challenging, full of variety, and emotionally and intellectually resonant—a subject that has engaged and continues to engage me. 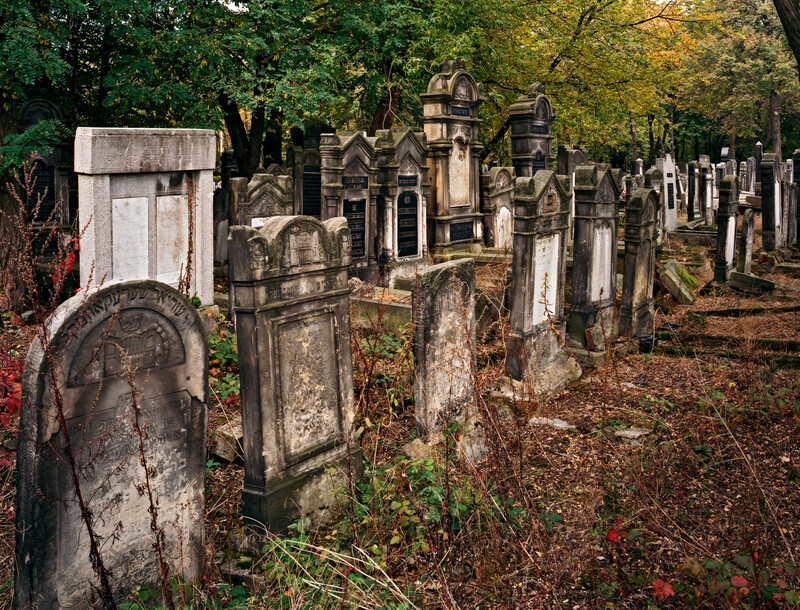 I have done extensive photographic work in four Polish cities with the largest Jewish cemeteries: Lodz, Warsaw, Krakow, and Wroclaw. This summer (2012) I am working in southeast Poland, travelling to significant smaller cemetery sites, such as in Tarnow. In addition to the cemetery photographs, wherever possible, I have also photographed synagogues and other significant Jewish historic architectural sites, e.g., remnants of the Warsaw ghetto and the ghetto environs of Lodz, significant buildings such as Poznanski’s palace in Lodz, and residential buildings in the Praga section of Warsaw, formerly a Jewish district. All of the colour images have been created either with 4 x 5 inch (10 x 12 cm.) film using an architectural view camera or with a digital view camera yielding images of 80 megabytes or more. In practical terms, this means the photographs can be printed in monumental sizes if desired, up to 60 inches wide (1.5 metres) or even more, yet showing exquisite detail.